Sunderland! Thirteen hundred years ago it was the greatest centre of learning in the whole of Christendom and the very cradle of English consciousness. In the time of Lewis Carroll it was the greatest shipbuilding port in the world. To this city that gave the world the electric light bulb, the stars and stripes, the millennium, the Liberty Ships and the greatest British dragon legend came Carroll in the years preceding his most famous book, Alice in Wonderland, and here are buried the roots of his surreal masterpiece. Enter the famous Edwardian palace of varieties, The Sunderland Empire, for a unique experience: an entertaining and epic meditation on myth, history and storytelling and decide for yourself – does Sunderland really exist? What is there to say about Alice in Sunderland? Off the top of my head I can say that I’m happy I finished it finally. When I reached that ending, an ending that felt like it was miles away no matter the closer I got to it, it felt like a great relief. It isn’t that Sunderland isn’t interesting, it is, but it makes you feel like you’re being bombarded by information left, right, and centre, because you are. 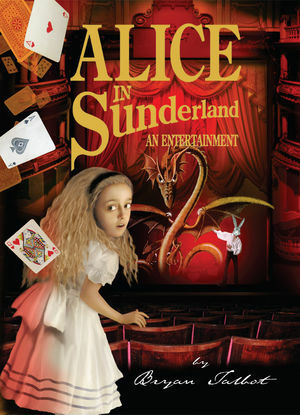 Sunderland is a graphic novel of information overload based around the history and connections of Sunderland, Lewis Carroll, and Alice in Wonderland. I would have loved all this information if it wasn’t absolutely drenched in it and had an easier way of either relating to the reader or a smoother delivery. This is a chaotic collection of information and facts dressed up in what is meant to be a fun way to experience it all, but it makes me feel like I should have had my umbrella, raincoat, and perhaps taken some form of hallucinogens before embarking on this adventure. The whole aspect of it is fascinating and half the reason why I kept reading was the six degrees of separation, but the text isn’t the only deluge, there’s also the images. The imagery comes across like a collage of photo-shopped pictures and drawings all overlapping each other and adding to the chaos. It’s great to see the places, faces, and art matching up with the words, but it’s so tumbled that it’s nauseating and most of the time I found my mind wondering not out of boredom, but as a coping mechanism. The idea is that there are two different stories, one of fact and one of fiction, and you’re meant to choose which one is right and wrong. When you make your way to the end, an end that you’re probably excited about because it promises to be over, you’re short changed. At least I felt short changed and that the ending could have come earlier. The story itself had a chance of ending at least three times, but it just kept going on and on and on and on…. Only read Alice in Sunderland if you’re not prone to headaches, absolutely love Carroll and British History, in particular Sunderland history.